Zoho Calendar is a free online calendar tool that enables users to keep track of their schedule, be it for their meetings, appointments, birthdays, or other significant dates. The application is not just capable of reminding users of their events, but it can also be maximized as a collaboration application. With Zoho Calendar, users can share and collaborate with calendars of friends, relatives and colleagues too. As the calendar is a dynamic application, users can check for Free/Busy work status information of their friends and set meetings at a most opportune time. As for other subscription options, Zoho Calendars lets users subscribe to friends calendars, holidays, other public calendars, and iCal feeds as well. For business purposes, Zoho Calendar supports subscription to your Zoho CRM calendars and Zoho Projects calendars. This functionality allows users to manage and stay on top of their personal as well as professional appointments with utmost ease. Zoho Calendar is so much more than just a free scheduling and appointment application. This cost-free tool comes with a plethora of benefits that many individuals and even large corporations will find beneficial, and which can help them steer their enterprise towards success. For one, Zoho Calendar efficiently brings the team together and lands them all on the same page. Team members who are on common calendar are able to collaborate with each other by creating and modifying events. Zoho Calendar makes its easy to send and even receive invitations from just about anyone. Users can easily invite people to events by sending the invitation straight to their email address. The best part is that is that the invitations can be delivers to any and every email service. For those who want to be reminded time and time again regarding events, milestones, dates, and appointments, Zoho Calendar can do just that. Get event reminders on email, as a pop-up or both. The system delivers notifications the way you want it, up to 90 days prior to the commencement of the event. 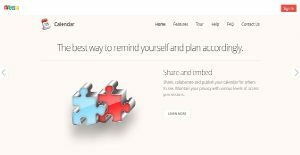 This calendar tool elevates collaboration further with its sharing and embedding functionality. It also allows you to access other Zoho applications, which are CRM, Meeting, Business and Planner. You can share your calendar with individuals or groups. In fact, you can even publish it on your website and set viewing permissions to public if you want to. It's essential to realize that virtually no software in the Collaboration Software category is an ideal solution able to meet all the needs of various company types, sizes and industries. It may be a good idea to read a few Zoho Calendar reviews first as specific software can perform well only in a really small set of applications or be prepared with a very specific type of industry in mind. Others may function with an intention of being easy and intuitive and consequently lack advanced elements welcomed by more experienced users. There are also apps that focus on a wide group of customers and give you a powerful feature base, but that in most cases comes at a more expensive cost of such a software. Make sure you're aware of your requirements so that you choose a service that has exactly the functionalities you search for. How Much Does Zoho Calendar Cost? We realize that when you make a decision to buy Collaboration Software it’s important not only to see how experts evaluate it in their reviews, but also to find out if the real people and companies that buy it are actually satisfied with the product. That’s why we’ve created our behavior-based Customer Satisfaction Algorithm™ that gathers customer reviews, comments and Zoho Calendar reviews across a wide range of social media sites. The data is then presented in an easy to digest form showing how many people had positive and negative experience with Zoho Calendar. With that information at hand you should be equipped to make an informed buying decision that you won’t regret. What are Zoho Calendar pricing details? What integrations are available for Zoho Calendar? If you need more information about Zoho Calendar or you simply have a question let us know what you need and we’ll forward your request directly to the vendor.